for India's first manned space mission- Gaganyaan. 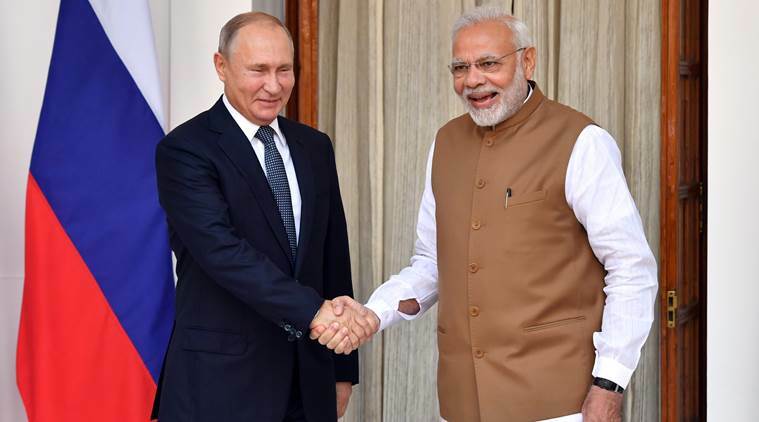 In this regard, both space agencies have signed MoU at end of delegation level talks between Prime Minister Narendra Modi and Russian President Vladmir Putin in New Delhi. Under the MoU on Joint Activities in the field of Human Spaceflight Programme, ROSCOSMOS has offered a ride to Indian astronaut for a short visit to International Space Station (ISS) on board Soyuz spacecraft for a short training mission in 2022. ISS is a habitable artificial satellite in the low Earth orbit. Russia had first made the offer to train an Indian astronaut for the mission when External Affairs minister Sushma Swaraj had visited Russia in September. Historically, India-Russia space cooperation was very strong, with Soviet Union being one of the three partners who helped India get off the ground with its space programme. This has continued for several decades including sending an Indian cosmonaut in a Soviet Soyuz mission in 1982. Former Indian Air Force (IAF) pilot Rakesh Sharma was the first Indian to travel to space. He was part of Soviet Union's Soyuz T-11 expedition, launched on April 2, 1984 of the Intercosmos programme. It is India's first manned space mission. Under this mission, India is planning to send three humans (Gaganyatris) into space in low earth orbit (LEO) by 2022 i.e. by 75th Independence Day for a period of five to seven days. The mission was announced by Prime Minister Narendra Modi during his 72nd Independence Day speech. Under this mission, crew of three astronauts will conduct experiments on microgravity in space. The crew will be selected jointly by Indian Air Force (IAF) and ISRO after which they will undergo training for two-three years. This mission will make India the fourth nation in the world after USA, Russia and China to launch human spaceflight mission. Enhancement of science and technology levels in the country. To serve as a national project involving several institutes, academia and industry. Develop technology for social benefits. Q. Name Russia's federal space agency that has agreed to worked together with Indian Space Research Organisation (ISRO) for India's first manned space mission- Gaganyaan?